There are a lot of factoring companies out there, and while most companies work nationwide, having a local partner in Illinois to factor your accounts receivable can be a huge advantage. DSA Factors has been located right here in Chicago, Illinois near the corner of Belmont, Lincoln, and Ashland ever since we became incorporated back in 1964. While we do work nationwide, our clients located here in Chicago and the surrounding suburbs get the added benefit of being able to stop in our office and speak with us face to face. As a result we are able to provide an exceptional level of service and come up with creative solutions for our Illinois based clients. Since we live, work, and play here in Chicago, we understand what Chicago is all about. Whether you are located in the Chicagoland area, Rockford, Joliet, Kankakee, Champaign-Urbana, Bloomington-Normal, Peoria, Springfield, Decatur, the Quad Cities, Carbondale, the St. Louis metropolitan area, or anywhere else in Illinois, DSA Factors has the knowledge and experience to help you grow your business. You live in the great state of Illinois, you should work with a great factoring company. Make DSA Factors your Illinois accounts receivable factoring partner and watch your business grow. They started attending more and more trade shows, not just here in Illinois, but all across the country and overseas, and the orders kept coming in and they started becoming more and more well known. In fact, you've probably even seen many of their products in decorative displays along Michigan Avenue in downtown Chicago. DSA Factors continues to help them grow even today. Ten years ago they were doing a little less than $1,000,000 a year. Today they do well over $2,000,000 every year and their sales volume continues to grow. DSA Factors is proud that we have been able to help them out for over twenty years right here in our home state of Illinois. Are you DSA's next Illinois success story? DSA Factors has always had a strong commitment to helping grow Illinois businesses. 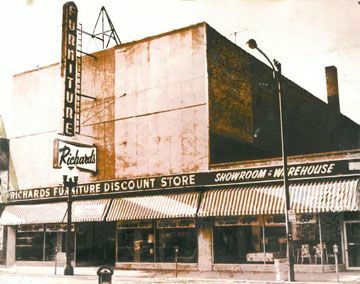 We are proud member of the Lakeview Chamber of Commerce here in Chicago, and have been at our Lincoln Ave location since 1955 when we opened our first business Richard's Furniture. Richard's Furniture was closed many years ago, but DSA Factors is still run today in the same building that Richard's Furniture built as an annex to their store. While we may live in Chicago and the suburbs, we've gone to school in Dekalb, Champaign, and Lincoln, and there isn't a corner of our state that we aren't familiar with. Whether you're in Chicago, the suburbs, or downstate, let us help you grow your business. If you are new to Illinois or have been here as long as we have, we have the experience and knowledge, as well as the funds that you need to grow your business. Even though DSA is a nationwide factoring company, we have more clients located here in Chicago and throughout all of Illinois than anywhere else in the country. As a result we factor for a very wide range of industries here in the Chicagoland area. These industries include furniture, textiles, lighting, flooring, giftware, food, marketing, consulting, accounting, staffing, construction, and more. Whatever your industry is, if you have receivables we can help. While we may not be the only factoring company out there, we are your local Illinois accounts receivable factoring company, and we guarantee you that you won't only get competitive rates from us, but also top notch service that you can only get from a local Illinois family owned and run business like us. DSA Factors is a member of the Lakeview Chamber of Commerce, and is very proud of our Illinois roots. Why use an Illinois Accounts Receivable Factoring Company? Clients in the Chicagoland area can stop by our office any time and speak with us face to face. We can offer you creative solutions that you can only get from an Illinois accounts receivable factoring company. When you work with us you are supporting two Illinois based businesses, both your business and our business, and supporting our local economy.